Such was the rebellious and Leftist Class of 1971 at the College of William and Mary. RIP, Dr. Robinett. This entry was written by whyevolutionistrue and posted on September 24, 2018 at 3:15 pm and filed under memorial. Bookmark the permalink. Follow any comments here with the RSS feed for this post. Both comments and trackbacks are currently closed. It sounds like he was a stand-up guy. Sounds like a good person. His grace in dying (and, it sounds like, grace in living) reminded me of the lyrics from “Candle in the Wind”, the version for Princess Diana. I have an aunt that is dying of pancreatic cancer. When last we spoke a month or so ago, she mentioned that the only good thing about dying is not living another day with Trump. I wouldn’t be surprised if many sensible people who are in the process of dying have this thought. And perhaps it’s even comforting. Yes, Trump is really that bad…worse than death. Well, not really, but you get my drift. until he’s gone for good (hopefully to prison). In the fall of 2016 the father of dear friend was dying. Barney was the only member of his family, save an uncle, who survived the holocaust. He survived because his family pooled their money and sent him to live in America before the war. He lied about his age in 1944 (he was 17) and joined up, killing as many Nazis as he could before the end of the war. He watched with alarm when Trump won the nomination. 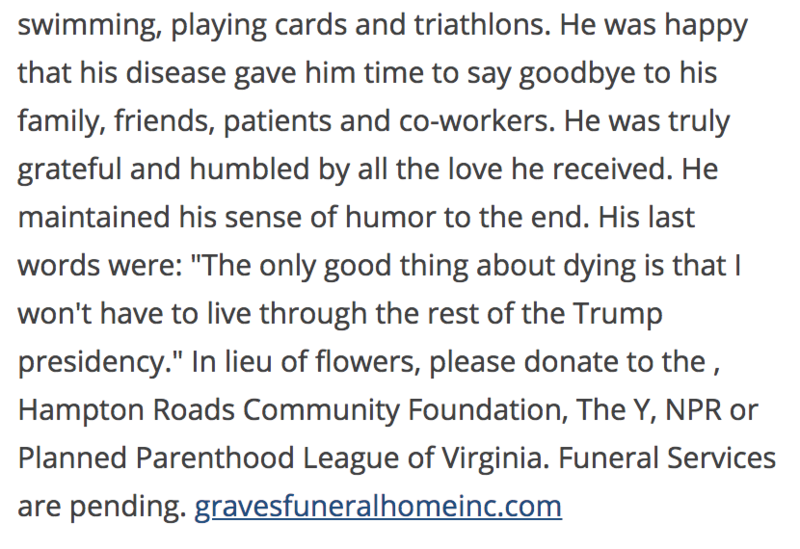 As he was dying he said that he was sad to be going because he’d “seen people like him (Trump) before” and he felt he hadn’t done enough to rid the world of people like him. I think that it was Barney’s words that really scared me that Trump might actually win. It’s been a slow-motion nightmare ever since. It’s probably good that Barney didn’t live long enough to see just how bad it is now in 2018. What an outrage for veterans is this fool of a POTUS. And some veterans venerate the guy…go figure. To Mike Cracraft (cool last name), I couldn’t agree more. If it comforts your aunt I wouldn’t denigrate that sentiment. Reminds me of the story about the guy facing a firing squad who was asked if he had any final requests — a last meal, a cigarette, anything like that. Your mate went out with his sense of humor intact; that’s saying something. Props to him.